Just one race in the area this weekend, but the 4th of July is looking pretty busy, as usual. "This 7.9 mile course travels alongside the Truckee River. Enjoy spectacular views along this stunning scenic corridor. This run is perfect for all abilities. The route is fast with little elevation gain. The course starts at Commons Beach with a stellar view of Lake Tahoe. It then heads on to the Truckee River Trail finishing at in the heart of the Village At Squaw Valley. There are aid stations and course marshals along the way to cheer you on and make sure you are hydrated. Event check-in and parking is located at Squaw Valley. A shuttle takes you to the start at Commons Beach in Tahoe City. You then run back to Squaw Valley." And "Yankee Doodle Chalk Art Fest", apparently. On Main Street in Gardnerville. Another link with more info. "Run To The Beach 5 and 10k starts at the North Tahoe Regional Park. From the park you have an option of participating in the 5K or 10K distance both of which finish on the “Big” beach in Kings Beach, CA. Kings Beach is a great place to spend your July 4th weekend. Fireworks are scheduled for the evening of July 3rd!" 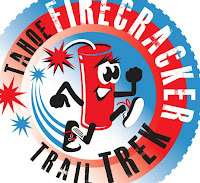 "Join us for the second annual Tahoe Firecracker Trail Trek, to benefit the Incline High School Boys and Girls Cross Country team. The Race will take place on the 4th of July as part of the Red White and Tahoe Blue activities. With separate races for kids and adults, this event is perfect for the entire family. Grab your racing/running/walking shoes for a great kick off to your 4th of July festivities!" "A 1 mile, gravity fed, fun event for all ages & abilities.The run begins at 9:45 am just before the parade along Donner Pass Road from US Bank to the Train Station. Runners are cheered by the thousands of parade spectators.The run is a fundraiser for The Auburn Ski Club’s Youth and Junior Nordic Programs." Has been canceled due to low participation.